Whenever I travel to a beach, I like to keep a little bit of sand and some shells as a souvenir. I am actually looking at a bottle of sand from the Maldives and little tray full of shells on a shelf behind my computer as I type this. Anywho, I thought it would be fun to try and make these souvenirs a little more wearable. So, I made a necklace. Of course I made it using things I found around the house, because if I actually had to go buy something, the probability of me actually doing this DIY would be quite slim. A shell with a hole big enough to put a thick string through it. 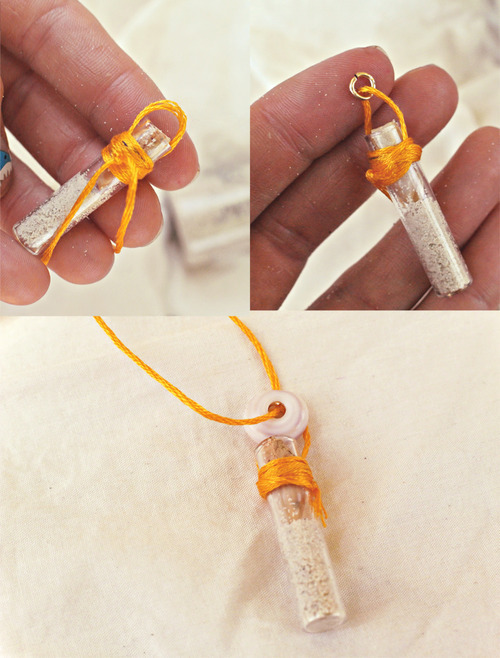 • If you happen to have a tiny shell that will fit, put it in the tube on top of the sand. 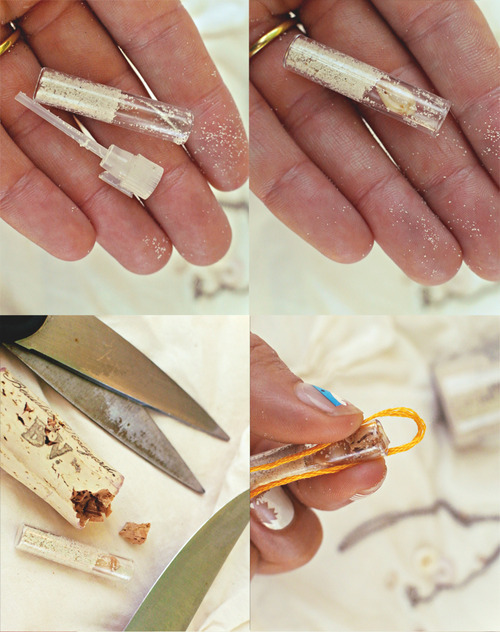 • Cut off a small section of a wine cork, and shove it in the top of the tube to keep the sand and shell in there. If you don’t have a wine cork some surf wax could work well too. • Now to make this tube a “charm” – Cut off about a 6 inch piece of embroidery floss, and fold in half. • Hold the floss in place with one hand so the fold is over the top of the tube, and you are holding the floss against the sides of the tube with one hand. • Wrap one half of the floss around the top of the tube a few times, then the other half a few times. Tie the ends in a secure knot, and cut off any excess. • Attach a jump ring to the loop, and voila, you officially have a charm. • Cut a piece of embroidery floss to be about 24 inches long (or feel free to use an old necklace chain). Then, string your new tube of radness and a shell that has a hole in it along the floss, and tie. You are the proud owner of a new necklace…that helps keep your favorite beach close to your heart. Pictured above: Tyler Rose bikini, Rails top, LLJ shark tooth, and my good ‘ol sunrise shell.